Today we met our tour guide Omar Deras at the entrance to St. Herman’s Cave in the Blue Hole National Park. St. Herman’s Cave is of great archaeological interest. 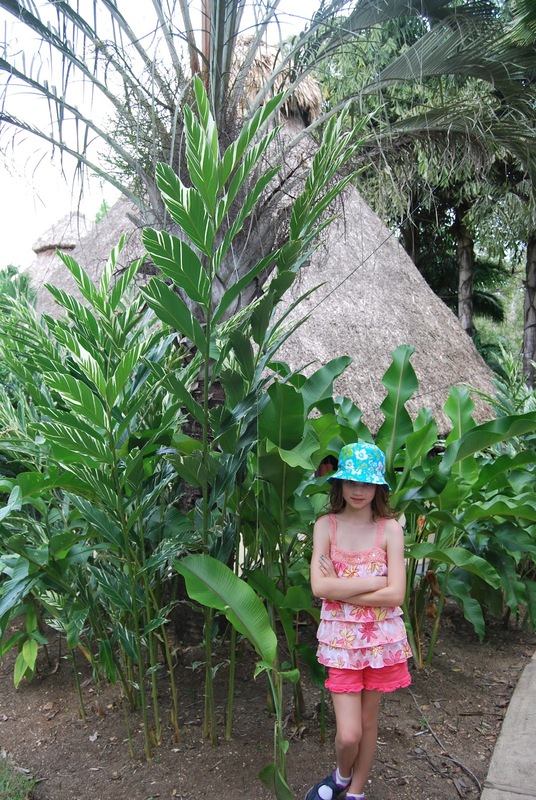 It was used by the Maya during the Classic Period up to 2,000 years ago. The ancient Maya believed that caves, particularly those with rivers flowing through and out of them, were entrances to the underworld, Xibalba. We saw remains of pottery vessels which were used for the collection of Zuh uy Ha (virgin water) from driping speleothems, actively growing stalactites. There were also charred remains of pots which were used to catch and burn blood sacrifices to the rain god Chaak during droughts. The blood was collected during bloodletting ceremonies in which priests and elders would pierce their tongues or foreskins. No evidence of human sacrifice has been found in this cave, unlike some others in Belize and Guatemala. All of the pottery pieces found in the cave have been shards, since the ancient Mayans believe that it was necessary to smash sacrificial vessels to release the spirits within. All those items are now studied by the Department of Archaeology in Belmopan. This cave system has been carved out of limestone by the Sibun River. We hiked up the cave, looking at the various formations and artifacts, then drifted slowly down the river for about an hour. We didn’t see or hear another soul for the entire tubing trip. We then hiked back up through the river to the entrance. We completely lost track of time and space for the 2 1/2 hour expedition. It was a jolt emerging into the tropical sunlight after so long underground. We saw a few cave-dwelling animals during the trip, such as this short-tailed bat. There were several species of bat flying throughout the cave during out trip. They roost in holes, or “pots” in the ceiling carved out by their acidic urine eroding the limestone. There was a large, active colony of cave swallows at the entrance to the cave. There were also many camel crickets as well as their main predator, scorpion spiders or whip spiders, which are actually not spiders, but arachnids closely related to scorpions, but without the stinger. They are harmless, despite their fierce appearance, and Omar even picked a large one up to demonstrate. Mary was not amused. After the tubing trip we stopped by the inland Blue Hole for a quick swim. The Blue Hole (not to be confused with the much large and deeper oceanic Blue Hole located int the barrier reef), is a formation where the river upwells into a limestone sinkhole, then travels as a daylight river for a hundred feet or so, then dives back down into another cave system. The hole itself is about twenty five feet deep and crystal clear. 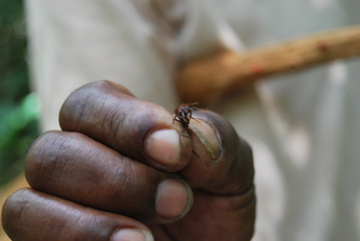 Our visit coincided with a huge group of army ants, which livened things up. Despite their large numbers they were very orderly, so it wasn’t too difficult to step over their trails. John learned that they have painful stings when he decided that it would be a good idea to flick them into the Blue Hole for the waiting tilapia to snap up. They found a red-rumped tarantula with an egg sac and forced her out of her hole. She was still struggling to escape when we left. It was the only time I’ve ever felt sorry for a spider. The highlight of the stop was a large purple-crowned fairy hummingbird taking a bath in the river just below the Hole. The emerald, white and black hummingbird repeatedly hovered right at the river surface and buzzed in the water, their form of bathing. She then perched on a branch and preened herself. 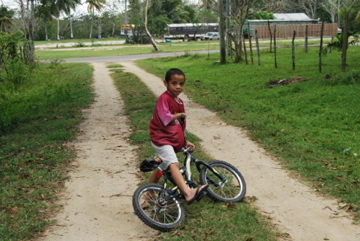 Today we visited the Cayo District in the western part of Belize close to the Guatemalan border. As we drove from the coast to the west, we were marveled by the beautiful hills and mountains rich in green dense jungle. From the humblest of beginnings Chaa Creek Cottages has grown into a 365 acre private nature reserve offering a range of exciting, educational adventures, expeditions and cultural experiences. The Natural History Centre, Butterfly Farm, Conference Centre, Macal River Camp bungalows, Rainforest Medicine Trail, Organic Maya Farm, eco-friendly Hilltop Spa and swimming pool are linked by miles of beautiful jungle trails perfect for bird watching, mountain biking, horseback riding, hiking, or just strolling through a pristine rainforest. The canoes remain the most popular way to explore the river and enjoy scenic excursions into San Ignacio Town. The Chaa Creek region has been a hub of Maya civilisation for thousands of years. They are now internationally recognised for providing an authentic Maya experience, and already this year played host to leading Mayanist and author Dr Mark Van Stone as well as a team from National Geographic magazine. Throughout 2012 they will be offering unique Maya tours, presentations, events and activities, culminating in the grand Winter Solstice celebrations on December 21. They offer the Reef and Rainforest Tour where you can combine a true Caribbean getaway with a Maya experience. Lunch was served by beautiful Mayan ladies dressed in white dresses with bright floral accents. The dishes were typical of the Latin culture. Salbutes stuffed with pico de gallo, cabbage, and chicken. Chicken soup with cabbage and potatoes. Xunantanich, located in the Cayo District is the tallest Mayan Ruin in Belize. We made the steep, but short, climb to the top of “El Castillo.” This vantage point provides a breathtaking, 360 degree, panoramic view over the jungle canopy of the Macal, Mopan and Belize River valleys, as well as a vast area of the Guatemalan Peten District, which is only a few miles away. You will also get a close look at the restored portions of two unique stucco friezes, which appear on the east and west sides of the upper portion of the pyramid. Located in the Cayo District in western Belize, Xunantunich is easily accessible. 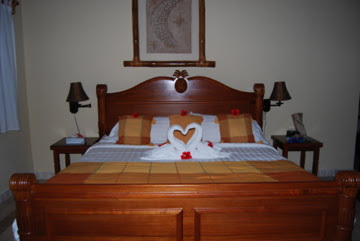 Most of the lodging facilities in the area offer day trips to the site, which is very popular with all tourists in the region. Almond Beach is a beautiful property in Hopkins, a small coastal village. This area has not become overdeveloped and is quiet in the evenings. Perfect for a family getaway or couple’s honeymoon. 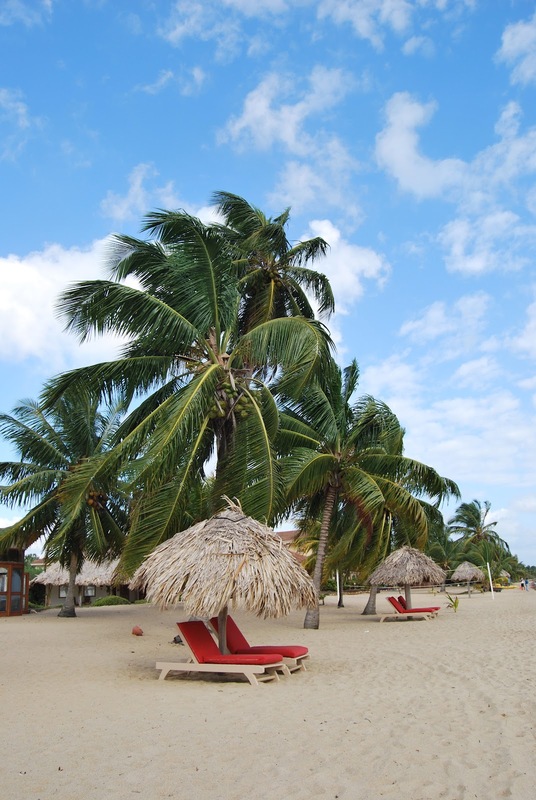 A Garifuna population inhabits the town and these friendly people staff the resort. These pictures give you an idea of the flora and the fauna that surrounds you. We are staying on the top floor of this incredible villa. These are individual cabanas located directly on the beach. 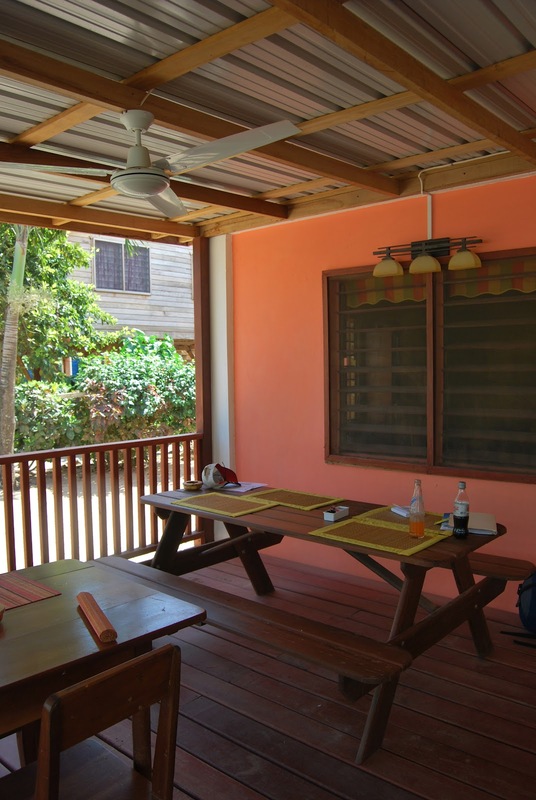 A boat dock directly in the front of the property takes you on snorkeling and fishing trips to the nearby South Water Caye and Glover’s Reef. 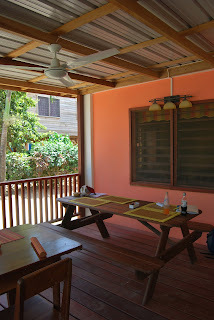 The view from our veranda and an iguana friend that sunbathed in front of our porch each day. Yesterday we ate a delicious lunch at Iris’s Sunny Side Up, a small restaurant in Hopkins village. The previous owner, Iris, started the restaurant 16 years ago with no running water or electricity. She still lives upstairs but the restaurant is now owned by a South African woman. She kept Iris’ name. Lightly fried Snapper fingers with a ginger sauce and new potatoes. Fried plantains and black beans with Chicken curry and vegetable. On our way to Hopkins from the airport in Belize City, we stopped at the Baboon Sanctuary in the small town of Burrel Boom. 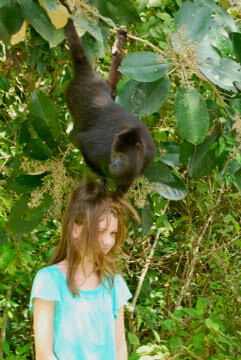 The Belizeans call the indigenous Howler Monkeys “Baboons”. There is an area of protected land where conservationists and residents cooperate to create a wonderful habitat for the Howlers. Residents allow the trees and vegetation to grow so the Howlers have plenty to eat. Our guide, Robert showed us where a family of Baboons were feeding and the mother and two babies came down from the trees to eat bananas from his palm. The mother had her hands on Mary’s head in eager anticipation of the treat. The father was very upset and howled severely until I finally told everyone to move out. The tree cutter ants are amazing. They are much bigger than our ants in the states. They travel in large groups transporting leaves from plants in the jungle to their hill. They spit on the leaves and a fungus grows provided them a source of food. The males have huge fangs which can be used as stitches when people get a cut in the jungle. 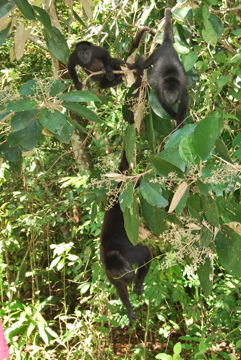 They create huge trails when they are foraging through the jungle. We tried not to step in the trails. 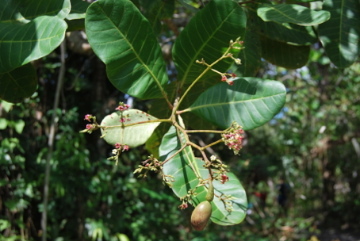 The cashew plant is used to make cashews like the ones we eat at home. They make wine from the fruit of the cashew tree. It is heard to be very strong in alcohol content. 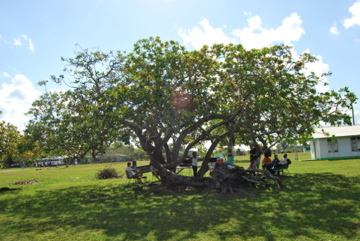 The picture below is a lovely cashew tree with people relaxing under it’s shade. While we were on the tour, a local boy did some dirt bike stunts. He was so cute that I couldn’t resist taking his picture. The Belizeans are very friendly and warm people. The official language is English, but many speak Creole and Spanish. We finally arrived at Almond Beach in Hopkins. This is a beautiful Spanish style property with clay tile roofs and mahogany interiors. 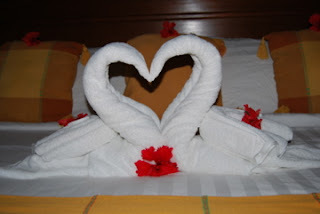 Upon arrival to our room, we found these swans made of towels and fresh flowers on our bed as well as on the kid’s bunkbeds. More pics of the property to come.